3 Speed Reading Techniques Examined: Do They Actually Work? Let’s continue on with our speed reading mini-series! In the first video in this series, we covered the science of how the reading process works – both how your eyes move and fixate on text, and how your brain constantly pauses to process the incoming information. The question is: do any of them work? Let’s start with the claim that speed readers can fixate on larger areas of the page. Some people have claimed that they’re even able to fixate on a page only once, taking a “mental snapshot” of the page and processing it all at once. Similarly, a 1962 study cited a speed reader who could attain a speed of 10,000 words per minute by making only 6 fixations per page, which were done in counterclockwise fashion around the page – apparently not following the lines of text at all. However, that study didn’t have any measure of comprehension, and further studies have shown that good comprehension can only be had when readers follow the lines. Additionally, text can’t be comprehended in the peripheral area of your visual range. A 1987 research paper on speed-reading reported only one correct answer out of 30 cases where a reader was tested on text further than 3 letter spaces from where they had fixated. Adding these findings to what we already know about the size of the eye’s foveal area, the results are clear: Fixations are small, and you can’t comprehend text that doesn’t fall within or very near them. But what about eliminating sub-vocalization? Some speed reading courses agree that you need to read the text in order to comprehend it, but your “inner voice” that essentially speaks what you’re reading is slowing you down. If you could somehow eliminate that sub-vocal speech, could you process text more quickly? Even if you’re not reading aloud, your brain sends signals to your vocal chords as you read. NASA scientists even developed a tool to detect and measure these signals. Scientists have done studies where they try to have participants eliminate sub-vocalization – in some by, by playing a tone when these vocal chord signals were detected, in others, by having the participants hum aloud while reading – and in each case, comprehension went way down. It seems that reading is inextricably tied to our auditory language processing capabilities, and trying to separate the two does more harm than good. So let’s move onto our third method – and this is the one that you guys requested I talk about the most. It’s the technique utilized by speed-reading apps like Spritz, Spreeder, and others, and it’s called Rapid Serial Visual Processing. These apps work by showing each word in a reading by itself in rapid succession. The words are fixed in the same spot, which eliminates the need for saccades – your eyes can remain in the same spot while the words change. The RSVP technique finds its origins in a device called a tachistocope, which flashes images using a slide projector in rapid succession in order to help people improve their recognition speed. Tachistoscopes were used during World War II to train fighter pilots to recognize other aircraft as friend or foe more quickly, and in the 1960’s, some schools started using them in an effort to help students increase their reading speeds. Many modern RSVP apps have their own unique features – for example, Spreeder allows you to choose how many words will be flashed on the screen at a time, and Spritz adjusts the position of each word in an attempt to help the eye reach its “optimal recognition point” more quickly. For all these features, though, independent research currently shows that RSVP systems don’t work well. One of the main problems is that RSVP systems present every word, requiring your brain to try to process them all. As we learned in the first video in this series, people don’t actually fixate on all the words in a text – content words are fixated upon much more than function words. In fact, that 1987 speed reading study revealed something quite interesting – for normal readers, it’s not just the length of the words that explains why content words are fixated upon more often. Even in reading tests where three-letter content words were used, normal readers fixated on a greater proportion of those content words compared to the function words. Skimmers and speed readers, on the other hand, fixated upon a nearly equal amount of content and function words in this type of test. This reveals that at normal reading speeds, our brains are able to intelligently fixate on the most important words. But with RSVP, that ability is taken away and every word is shown. This makes your working memory the bottleneck; it strains to keep up while all this text is flooding in at one constant rate. My own informal tests of RSVP systems confirm this; I find it exhausting to read this way, and I’m typically unable to remember many details after doing it for more than, say, 30 seconds. Another strike against RSVP apps is that they don’t allow for regressions – going back to re-read text you’ve already read. Elizabeth Schotter conducted another study in 2014 that looked at RSVP systems in detail, and the conclusion of this study was that this is a big problem. The inability to make regressions affected comprehension levels negatively. So, in my eyes, the usefulness three techniques as they pertain to reading for comprehension and learning has been thoroughly debunked. Does that mean they’re all useless? Maybe not in all cases – for example, I’ve read some opinions that RSVP apps can be useful for quickly reading through things like text messages and emails. However, if you’re trying to learn new material from a book, I’d recommend against using these techniques. They won’t help. If you’re curious to dig deeper into the studies and articles I used to research this video, check out the Video Notes section below. 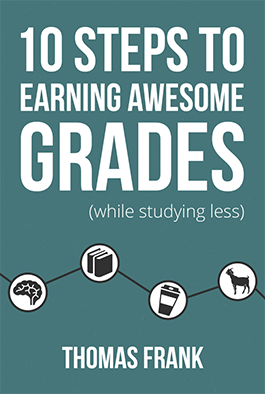 If you want to learn how to read and learn from books more effectively, you’ll find a lot more tips in my book, 10 Steps to Earning Awesome Grades (While Studying Less). So, who now is itching to fight me IRL now that I’ve made this video? Seriously, though, I’d love to hear your thoughts on these and other techniques you might have tried.